Christmas Island with its capital is located in Asia (Southeastern Asia, island in the Indian Ocean). It covers some 136 square kilometers (about three-quarters the size of Washington, DC) with 2,205 citizens. English, Chinese and Malay are the common languages used in Christmas Island (consider regional differences). Thiscountry has no land-based border with any other country. Christmas Island is one of the islands of the Indian Ocean, south of Indonesia. Christmas Island rises to a central plateau of stands of rainforest. Its 80km coastline is an almost continuous sea cliff up to 20 metres high, with a few shallow bays of small sand and coral shingle beaches. The largest of these forms the island's only port, Flying Fish Cove. As a territory of Australia, English is the most common language spoken on Christmas Island, but is not universal. Many older residents speak dialects of Chinese and Malay as a first language. As Christmas Island is duty free, alcohol is usually lower priced than the Australian mainland. The island is safe all times of the day in the populated areas, locals usually leave their houses and car unlocked. There are no poisonous or dangerous animals/insects on the island. It's good manners to wave back if waved by locals when driving. Cocos Islands is the closest land to Christmas Island and there are weekly connecting flights which take about 1 hour. View the spectacular world famous Christmas Island Red Crab Migration during the December - February months. Walk, ride, or hire of cars/4WD/SUV. You can hike around the settled areas of island, as most locals are happy to give a ride to visitors. The topography is steep cliffs along coast rise abruptly to central plateau. The average density of population is about 16 per km². The climate in Christmas Island can be described as tropical with a wet season (December to April) and dry season with heat and humidity moderated by trade winds. Potential natural disasters are the narrow fringing reef surrounding the island can be a maritime hazard. To reach someone Christmas Island dial +61 prior to a number. The local cellular networks are operated on 900 MHz, 1800 MHz. Websites typically end with the top level domain ".cx". If you want to bring electric appliances (e.g. battery chaarger), keep in min the local 230 V - 50 Hz (plugs: I). The sign for the locally used currency Dollar is AUD. 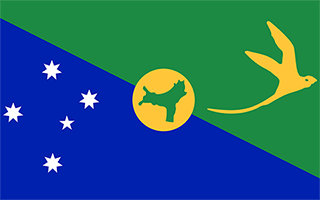 Territorial flag; divided diagonally from upper hoist to lower fly; the upper triangle is green with a yellow image of the Golden Bosun Bird superimposed; the lower triangle is blue with the Southern Cross constellation, representing Australia, superimposed; a centered yellow disk displays a green map of the island.